Inolife names Dr. Claude Vezeau as Chief Clinical Officer and Dr. Nadeem Siddiqui as Chief Scientific Officer, adding combined five decades of medical industry and research experience to Inolife's executive leadership. TORONTO, May 18, 2018	(Newswire.com) - Inolife R&D Inc., an emerging innovation leader in the development of needle-free injection devices, today announced two new key executives joining the company. 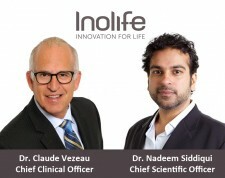 Effective immediately, Dr. Claude Vezeau is the company's CCO and Dr. Nadeem Siddiqui is Inolife's CSO. Dr. Vezeau is responsible for envisioning, developing and managing Inolife's expanding clinical capabilities, including critical areas of compliance, evidence, validation and utility reporting for the company's product offerings. Over the course of his career Dr. Vezeau has held a number of senior positions in the biopharmaceutical industry, including as a partner in BioCapital, the first and very successful private biotechnology VC in Quebec, and as President of Biochem Vaccines, a leading developer and manufacturer of human vaccines. The naming of our CCO and of our CSO will give us the opportunity of planning and advancing Inolife's long-term strategy, while also managing external challenges and engaging with government policy and industry leaders. Dr. Siddiqui is responsible for Inolife's scientific operations, including research & development across the full spectrum of applications. He is also the executive liaison tasked with connecting the company with the scientific community at large. He joins Inolife with over 20 years of medical research experience and is a respected peer journal-published author of studies on diverse topics, including structural biology, protein synthesis, RNA metabolism and cancer. Inolife R&D Inc. is an emerging specialty medical device company focused on developing and commercializing novel drug delivery technologies. Inolife commercializes patented and FDA-cleared needle-free injection devices. The company was founded to take advantage of novel techniques of the liquid jet and ballistics-based epidermal drug injection that improve patients’ quality of life by making medicines easier to administer, work better, and remove the anxiety and inconvenience associated with hypodermic needle injections.